Improve Text Entry On The HP TouchPad - Use a Bluetooth Keyboard! The only solution for HP TouchPad owners is a Bluetooth keyboard, which gives great results. 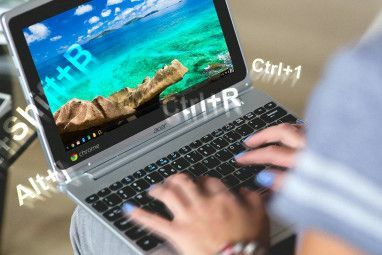 There are a couple of ways in which you can connect a Bluetooth keyboard to the HP TouchPad, depending upon which operating system you have installed. You might still be running the native webOS or you might have decided to upgrade your TouchPad to Android Ice Cream Sandwich How To Install Android Ice Cream Sandwich On The HP TouchPad In Minutes How To Install Android Ice Cream Sandwich On The HP TouchPad In Minutes As slick, smooth and functional as webOS is on the HP TouchPad, and wherever the future of the platform may lie, there remains a problem – the shortage of apps. The fact remains that there... Read More . Either is fine; both operating systems will allow you to connect your Bluetooth keyboard. But why use an external keyboard with your tablet? If you’re using a tablet computer the chances are that at some point you have used the software keyboard, either for typing in your name or email address or for searching the web. You might even have used the keyboard for emails or other longer documents. With the HP TouchPad, a single software keyboard is available by default, and proves rather useful for text entry. However, it isn’t perfect – the dimensions of the display and the arrangement of the keyboard can make punctuation difficult, for instance. This is why using an external hardware keyboard with a tablet is so useful. While it might not be ideal in all situations, you can certainly find plenty of use for a hardware keyboard when using your TouchPad on a desk, sat on a train or plane or other similar scenarios. Setting up your Bluetooth keyboard with webOS requires that you pair the device to your tablet. Open Launcher > Settings > Bluetooth and switch to On. The tablet will activate the short-range wireless protocol and then prompt you to +Add device. Tap this, and select Keyboard from the Type drop-down menu. Once the keyboard is found, tap the device on your TouchPad display. The two devices should then pair. If you need to unpair for any reason, open the Bluetooth screen again and drag the listed device to the right, selecting Delete to discard it. Setting up a connection in Android Ice Cream Sandwich is just as easy. With your Bluetooth keyboard switched on, fully charged or with fresh batteries and ready to use, open Settings > Bluetooth and switch to On. Next, wait while the TouchPad searches for the keyboard; it should eventually display HP TouchPad Wireless Keyboard. Tap this, and enter the code on your keyboard as instructed. With this entered, the keyboard will be paired with your TouchPad! Various Bluetooth keyboards can be used with the HP TouchPad. Basically, all you need is a device with Bluetooth capability and it should connect to the tablet without any problem. Anything from a standard desktop keyboard with Bluetooth to the dedicated HP keyboard specifically released for the HP TouchPad should do, although there are plenty of alternatives, from small handheld keyboards to mobile phones with the capability of broadcasting text entry via Bluetooth. If you use the specially-designed HP device, once paired, you will notice that there are several keys designed specifically for use with the TouchPad. These might not be as comfortable as a standard sized keyboard but they will allow you to use your tablet in interesting new ways. 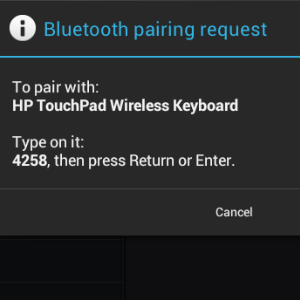 If you use a HP TouchPad and have access to a Bluetooth keyboard, these steps should enable you to quickly connect and set up your keyboard with your tablet. The results are similar to using a notebook device, and in terms of using your tablet as a word processor, extremely satisfactory. However, this might not be the solution for everybody. There are various software keyboard applications for webOS and Android that you might prefer, for instance. So which typing experience do you prefer? Let us know in the comments below. 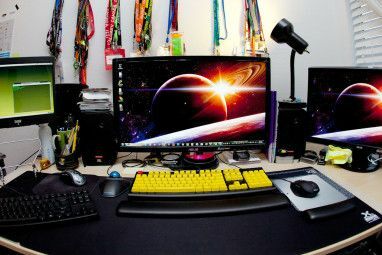 Explore more about: Keyboard, Mobile Accessory, Touch Typing. 5 Sites and Apps to Find Movies & TV Shows to Watch on NetflixMantano Reader: Effortlessly Read Ebooks On Your Android For Free!